You can already feel the chill in the air, which means it’s time to start thinking about Coats for Kids, a program offered by Cudney’s Launderers and Dry Cleaners, and sponsored Fox 23 News. A warm coat is something many of us take for granted, but no child or adult should have to go without. So, take a look in your closets and see if there might be some warm coats in good condition that could be of use to someone in-need. Coats can be dropped off at any Cudney’s location, and the fabulous folks there will clean them and make sure they get to people who need them. Children’s and adults’ coats are accepted. A little tip: Please make sure the zippers are in working order so no one has to feel the winter chill! Thank you! Click here for a list of Cudney’s locations! Our first attempt at helping to take the spook out of spending for local families was a huge success! Over the past several weeks, generous community members have been donating new and gently used costumes to help the families served by Franklin Community Center. 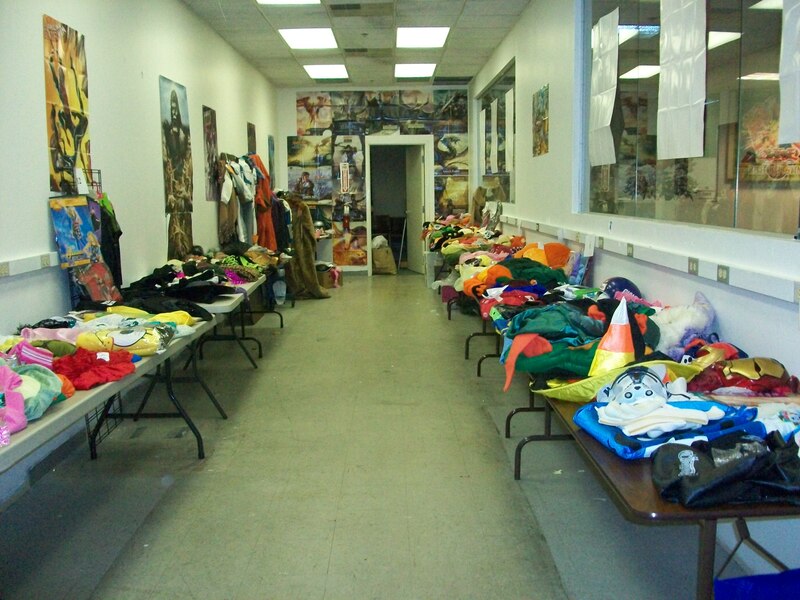 Thanks to The Comic Depot who let us use their space, we were able to outfit about 75 children with Halloween costumes, last evening. Watching the kids’ faces light up as they chose their costumes was awesome! We are so grateful for the constant outpouring of support we receive from our donors, no matter what the cause. Get ready for next year because we plan to do it again. Since this was our first year, we learned to get more costumes that are sized for our Project Lift kids, ages 6-10, to make sure we have enough. 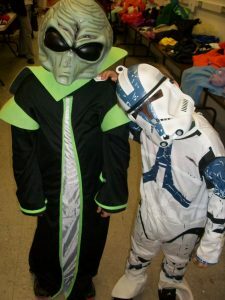 So, hang on to your costumes from this year; next October, you can plan to share them with local families who need them! Want to spread the merriment this holiday season??? Franklin Community Center is looking for people to purchase gifts for local children in-need. If you are interested in adopting a child or family, or if you’d just like to purchase miscellaneous gifts/toys for us to distribute to those on our list, please contact us at 587-9826 for more information. We are also taking donations of non-perishable items for Thanksgiving meals, as well as vouchers and gift certificates for turkeys. We look forward to partnering with our generous donors to help make the holidays brighter for those who need our help. Thank you! It began with a phone call as I was helping Debbie at the front desk on a typical, busy Wednesday morning in July. Upon taking the call, I was informed by a well-spoken woman on the other end of the phone that she was recently homeless, looking for food and shelter until she could start her job a week later. She had been to DSS. The shelter was full, as it often is during the summer months, and she was starting to feel like she had overstayed her welcome with friends. I tried to reassure her on the phone, and I could feel my chest tighten as I sensed her desperation. I invited her to come to Franklin Community Center, where we could help her with food to bring to her friend’s home where she was staying the next two nights, and I explained that she could fill out an application for our low-income housing apartment building, where we could put her on the waiting list. She said she’d be in soon. As I hung up the call, a group of women who live at a local shelter in town came in to pick up vouchers for our free store at 101 Washington Street. I decided to ask the ladies standing in the office whether there might be any openings where they live, and a quick reply offered a glimmer of hope for the woman I had just spoken with on the phone. “We’ll have an opening at our shelter on Friday,” said the kind-hearted woman in front of me. She was eager to help, empathizing with that feeling of desperation, and she shared some important contact information for me to pass along when I met the woman on the phone in person. When she arrived at the center 20 minutes later, she asked for me. I sat down with her for a moment in the lobby to take down her information. She shuddered as she listed “homeless” as her address, and I tried to remain positive as I shared the information regarding the women’s shelter. As I returned back from the food pantry with some groceries for her, I could see she was crying. As she tearfully whispered her concerns to me, another woman getting assistance overheard. “I’m sorry to listen in, but did I hear you say you need a place to live?” she asked. “I saw you crying, and I know how scary it is. I’ve been there, done that,” she explained. She went on to say that in one week—right around the same time the woman I was helping would begin her new job—she would have a mobile home for rent. The two exchanged information, offering another option for the woman who, just minutes ago, was not only homeless, but hopeless. There are moments in my job every day that make me incredibly proud to do what I do, but in this case, it was just a matter of being in the right place at the right time. It’s about people in need, supporting other people in similar, difficult situations. It’s about empathy, kindness, and a willingness to help, no matter how big or small your offering is. It’s also about a very real, but seldom-seen picture right here in our city; because on the other side of town, away from the galas, the glitz and the glamour, there is a different crowd, struggling to make ends meet and relying on others to help them when they don’t know where to turn. And in some cases, it’s about a lack of options, with not enough affordable housing for the people who work in our city to keep the tourism industry thriving. It’s not about feeling guilty. We should have fun and revel in all of the amazing things our city has to offer and be grateful for what we have. But when we find ourselves judging others without knowing who they are or where they’ve been, or when we catch ourselves dwelling on the superficial, let us be reminded of those who might not be so lucky. It’s a lesson I learned at the perfect time, from people whom I least expected to teach me. And I couldn’t be more thankful. We are thrilled to unveil our newly spruced-up website, designed to be fresh, inviting and user-friendly for all of our visitors. We’re making our mark in the community and on the web to be sure everyone realizes the importance of why our agency exists. As you may have heard, Franklin Community Center has a lot going on these days, with our bustling food pantry, the start-up of Project Lift for this school year and the approaching holiday season. We are seizing the opportunities to create new relationships and maintain old ones as we continue meeting the needs of our area’s struggling residents. Record numbers of people in need have us seeing more new faces than ever before, with individuals relying on our services that would never have imagined they’d hit such tough times. But we’re aiming high, moving forward and striving to do what we have always done best, and we have a capable and passionate staff that will not let the adversity of difficult economic times get the best of us. So keep visiting, reading, clicking and supporting us in any way you can–it’s the fuel to our fire that motivates us each and every day. Come and knock and our bright blue door (actually, you don’t need to knock 😉 and join us in our mission of making a difference. We look forward to seeing you.